A retaining wall is an effective means of controlling soil shifting and erosion around homes, trees and garden plots. Normally constructed of brick or heavy blocks, retaining walls can cost thousands of dollars to design and install. 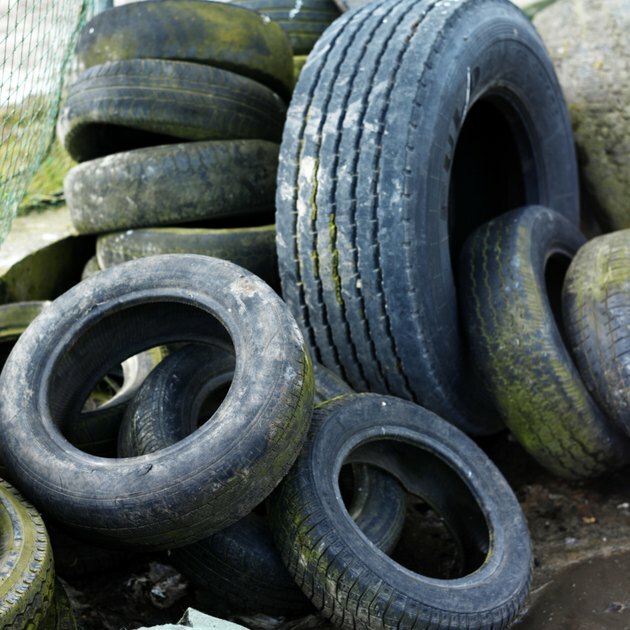 Recycled tires are a useful building tool and, when stacked and stabilized, make an acceptable alternative to commercial brick retaining walls. Old tires make sturdy retaining walls. Clear the ground of all large rocks, branches and yard waste. Set the rocks aside, as they will be used to stabilize the inside of the tires. Cut a number of tires in half, and set them aside. These half tire sections will fill in small gaps as you build up the retaining wall. Lay the first row of tires side by side to form the base of the retaining wall. Fill the inside of each tire with rocks and dirt, and tamp the dirt down with a motorized ground tamper. Add more fill dirt as the dirt inside the tire compacts, filling and tamping each tire until the filled center is level with the surface of the tire. Stack a second row of tires on top of the first, centering the first tire over the junction between the first and second tire on the bottom row. Staggering the tires in this fashion adds strength and stability to the retaining wall. Fill and tamp down the second row of tires. Add a third row of tires over the second row. Support the top tire on each end of the wall by sliding a half tire section into the gap between the first and third rows. Fill this uppermost row, packing it down firmly with the tamper. Repeat Steps 4 and 5, stacking tires as high as necessary to complete your wall.